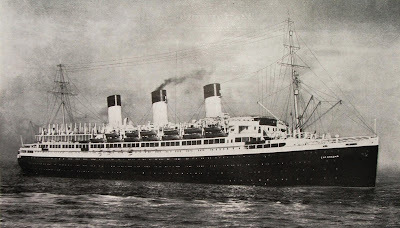 The Cap Acona was a German liner of the Hamburg-South America Line, that interestingly enough stood in for the Titanic in the German movie of 1942 named, creatively enough, Titanic. 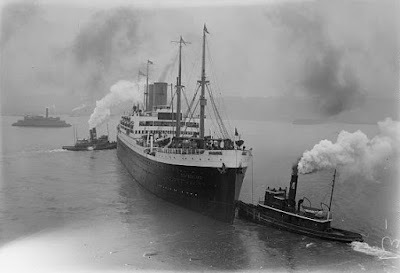 From operating as a cruise liner prior to the outbreak of the war, she was then painted grey and entered war service and its last runs were evacuating German soldiers in the Baltic from the advancing Soviet Army. Himmler had ordered that concentration camp inmates were not to be allowed to be rescued by the allies alive. Himmler and other Nazis, seeking to hide evidence of their crimes sought to wipe away all evidence. Concentration camp inmates, mainly from the Neuengamme concentration camp near Hamburg, and the Stutthof and Mittelbau-Dorastarting camps began on April 20, 1945 and prisoners were ferried to and loaded on the ships Cap Arcona, Thielbek and Deutschland. The Cap Arcona, a liner by this time did not have functioning engines. When the ships were full and there were still more concentration camp inmates from Stutthof and Mittelbau-Dorastarting could not be loaded, the SS simply machine-gunned or beat to death 500 inmates on the beach. 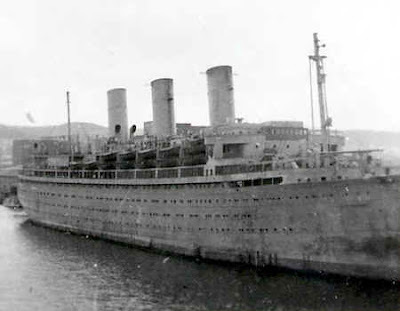 The full ships with prisoners locked aboard lacked the facilities for caring for them and 20-30 of the prisoners died daily from April 20 up to May 3, 1945. Hitler had already shot himself on April 30, but the killing went on. The SS planned to sink the ships with all aboard. In a terrible irony of war, It turns out they would not be the ones to sink the ships after all. The ships were to be sunk by the Allies. On May 3, 1945 just days before the end of the war, Typhoon fighter-bombers of Royal Air Force 83 Group roared overhead and commenced an attack, firing rockets and dropping bombs on the ships, and then strafing survivors in the water. 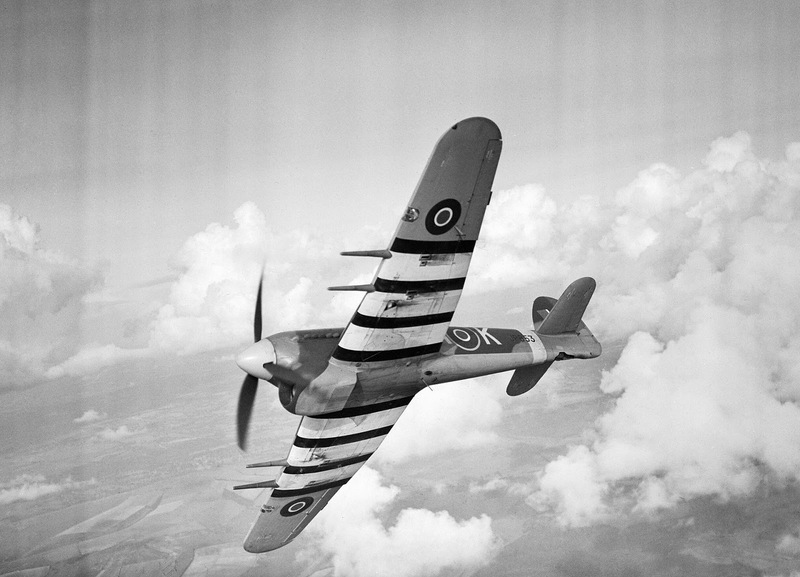 While Swedish and Swiss Red Cross officials had informed British intelligence on 2 May 1945 of the presence of large numbers of prisoners on ships at anchor in Lübeck Bay, and RAF intelligence was informed of this, this vital information failed to be passed on to the RAF pilots who were instead instructed to attack the ships on the belief that they might be used by the SS to escape and set up resistance elsewhere. Wracked by rocket fire and bombs, The Cap Arcona was immediately set on fire and capsized soon afterward. The Thielbeck was set afire and capsized in 20 minutes. The Deutschland also capsized and sank but apparently all on board survived and were then loaded onto the SS Athen. 5,000 died when the Cap Arcona sank with only 350 concentration camp inmates surviving. By comparison, 490 of the 600 Germans on board survived. Of the 2,800 prisoners aboard Thielbek, only 50 survived the attack. 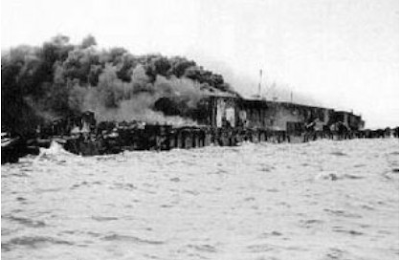 The SS then proceeded to shot those survivors who could not move unassisted from the water. 1971 is the last year where known bones from this attack have washed ashore. British records relating to the incident are apparently sealed until 2045.